Two very important people hit benchmark anniversaries over the weekend! 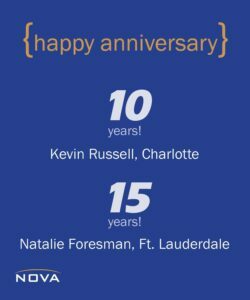 Kevin Russell, Charlotte, has been with NOVA for 10 years and Natalie Foresman, Ft. Lauderdale, is celebrating 15 years! Quite an accomplishment!